Nancy Reagan's recent death pushed us to take a trip down memory lane back to when her husband Ronald Reagan was President. Readers will surely recall one of Reagan's famous speeches when he said to the then leader of the Soviet Union, "Mister Gorbachev, tear down this wall." Reagan was of course referring to the Berlin Wall, which was erected back in 1961 to divide West Berlin from East Berlin (to stop East Germans from fleeing to the West). We bring this up because since then, Germany has grown and thrived into a strong global economy. Roll forward 27Ys since the wall came down and we see another historical wall falling down. This time it is the relations one between the US and Cuba. Here, after more than 50 years of separation, suddenly President Obama has begun to open up relations again. No matter where you fall in the political spectrum on all of this, it is certainly interesting to observe. As you would expect, the first US companies to get into the action were the airlines. As restrictions have eased over the past year, US citizens have booked travel to Cuba and airlines have responded with 110 flights per day now. Given that the American business community is now permitted to work directly with the private sector, we wondered how long it would take until US banks began to make the move to support the flow of money and financial activity that will likely occur in the coming years. Travel website Cond? Nast gives tips on traveling to Cuba so we focused in on the banking side of things to explore opportunity. Here, the advice is to carry cash because no vendors, restaurants or taxis on the island will take credit cards. They also indicate ATMs are few and far between and often run out of cash. Enter the first US financial institution to do business in Cuba--Stonegate Bank ($2.4B, FL). In July 2015, Stonegate established the first correspondent banking relationship with a Cuban bank, opening accounts at Banco Internacional de Comercio S.A. In November 2015, the bank announced it would now offer a debit Mastercard for use in Cuba at point of sale terminals. This opens up card use at hotels, restaurants and merchants on the island but not ATMs. Things are moving quickly indeed and other banks are watching this activity unfold very closely. One key issue flagged by an attorney with Holland & Knight that has kept other US banks from jumping into the fray relates to one of the new regulations about doing business in Cuba. 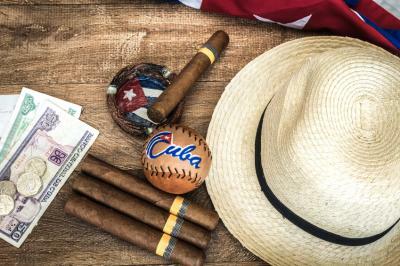 It indicates that travelers must identify for the bank which of 12 categories they fall under when traveling to Cuba, but the regulation is not clear on what happens if the person lies. If the bank has a reason to know why the person is going and that the information given may not be correct, banks aren't sure what will happen to them and how regulators will respond. As such, the largest banks have requested more clarity on this and other matters. Suffice it to say that at only 90 miles from America, over time other US banks will surely follow Stonegate into Cuba as the financial rush continues to grow. After all, that distance is about the same as going from Chicago, IL to Milwaukee, WI. For now though some bankers are closely monitoring things, reading the regulations and watching the airlines, cruise lines, hotels, Airbnb, farmers and the tractor manufacturing company already operating there. Crazy times but perhaps, as with Berlin, over time the walls will come down in Cuba and community bankers may find additional opportunity in the years to come. Yields dropped 3bp following the release of economic data indicating sluggish US growth in Q1. The CFPB has proposed new disclosure requirements for federal student loans that will require servicers to provide a repayment plan to borrowers and options to do so (including setting monthly payments based on income). The agency reported 43mm Americans have student loan debt for a total of about $1.3T. The Wall Street Journal is reporting the CFPB plans to bring the largest online lending platforms under its supervision by 2017. The latest CNBC Fed Survey of 48 economists, strategists and fund managers finds: 94% say the next move will be a rate increase; the next rate hike is expected in August; the likelihood of entering recession is 21%; and the Fed won't start to reduce its massive balance sheet holdings until March 2017. Of course, we would be remiss if we did not point out that research shows economic projections such as these can be wildly inaccurate as well and even worse than weather people at predicting weather. Our best advice is to prepare, test, stress and diversify continually as the data and volatility likely continue to shift around. CNBC reports Goldman Sachs says its Financial Conditions Index has bounced back to levels not seen since mid 2015 as global conditions have settled down and that it implies positive US growth ahead. Goldman economists updated their forecasts and indicated they now believe the Fed will "tighten monetary policy by significantly more than discounted in the bond market." In an effort to improve the customer experience and speed purchase times, CNN reports Visa is upgrading its software for chip embedded credit cards. The changes are coming soon and will reportedly allow people to use the chip and get approvals in about 2 seconds vs. the roughly 10 seconds it takes today.